From August 1 through August 15, shoppers at Macy’s Boca Raton Town Center and Macy’s Boca Raton Furniture stores will have the opportunity to “Make Good Cents” by voluntarily rounding up their purchase(s) to the nearest dollar, up to $.99 and donating the difference to Habitat for Humanity of South Palm Beach County (HFHSPBC). 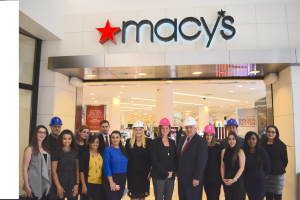 Selected by Macy’s in Boca Raton as its local beneficiary for the brand’s national “2018 The Big Give Back – Make Good Cents for Your Community” round-up donation campaign, HFHSPBC brings people together to build affordable homes, community and hope in the cities of the Boca Raton, Delray Beach and Boynton Beach, Florida. “The power of a national retail brand such as Macy’s supporting a local affiliate of a leading nonprofit global brand as Habitat for Humanity exponentially increases awareness and drives a resonating give back dynamic within a community,” HFHSPBC Vice President and Chief Development Officer Kari Oeltjen. “It is with great gratitude that together — through this opportunity — that Macy’s, its shoppers and we at Habitat will enrich lives and communities, one home, one family at a time.” She added that when Habitat homeowners earn their homes through sweat equity programs, qualifying for zero-interest mortgages and completion of Habitat’s financial literacy classes, it changes the trajectory of entire families for generations because they are the first in their family line to both achieve homeownership and be in a position to contribute back to their community. Kari Oeltjen at koeltjen@hfhboca.org or (561) 819-6070 or visit http://www.habitatsouthpalmbeach.org/.